Tonight I would really like to share a wonderful blog with you all. It is "My Way - My Path" from lovely Mark. I first started reading Marks blog when he was preparing to walk the "El Camino de Santiago" or "Santiago de Compostela Camino" pilgrimage in north-west Spain. 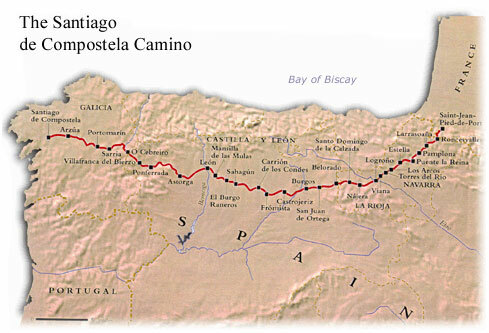 The reason Marks blog grabbed me was because years ago I read Shirley MacLains book "The Camino: Journey of the Spirit". It was her story of when she did the pilgrimage and what a spiritual event in her life it turned out to be. I must say it was and is still one of my most favorite books. Thank you Mark for sharing the walk and your life with us. Just recently I have realized what attracts me most to a blog - it is people just being themselves and sharing their day to day life with us. That's exactly what Mark does - thanks again Mark. Oh, it is a small world, Davine, isn't it? I, too, love reading Mark's adventures ~ real people with real stories.